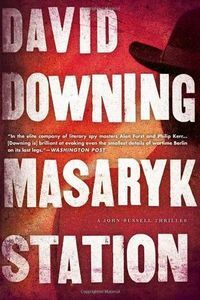 Masaryk Station by David Downing: Synopsis and Online Purchase Options. Synopsis (from the publisher): Berln, 1948. Still occupied by the four Allied powers and largely in ruins, the city has become the cockpit of a new Cold War. The legacies of the war have become entangled in the new Soviet-American conflict, creating a world of bizarre and fleeting loyalties — a paradise for spies. As spring unfolds, a Western withdrawal looks increasingly likely. Berlin's German inhabitants live in fear of the Soviet forces who occupy half the city, and whose legacy of violence has ripped apart many families. John Russell works for both Stalin's NKVD and the newly created CIA, trying his best to cut himself loose from both before his double-agency is discovered by either. As tensions between the great powers escalate, each passing day makes Russell's position more treacherous. He and his Soviet liaison, Shchepkin, seek out one final operation — one piece of intelligence so damning it could silence the wrath of one nation and solicit the protection of the other. It will be the most dangerous task Russell has ever taken on, but one way or the other, it will be his last.